WOW! Hey readers, I just got back from my first day of high school and man was it a bunch of fun. Confused? Didn’t you know that the actual first day of high school for a 9th grader is actually high school orientation? 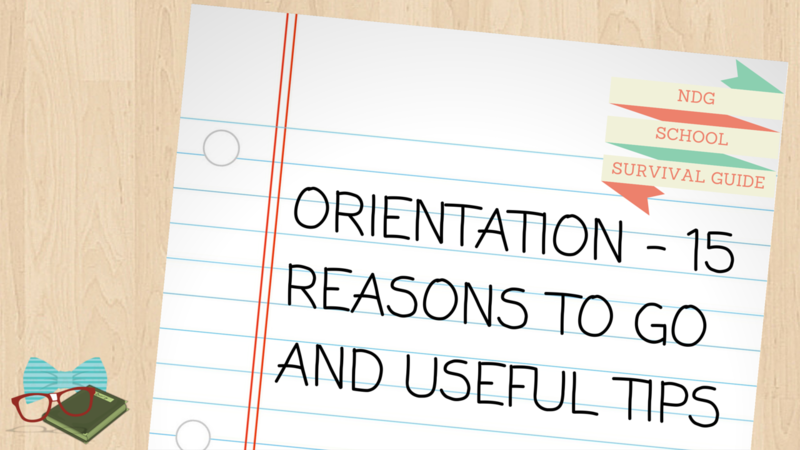 Okay, so I’m a little bit off a sugar high so please forgive my writing, but these are 7 reasons to go to Orientation and 8 awesome tips when experiencing it. Also, if you’re new to my blog, check our my Ultimate Back to School (9th Grade) Supplies Haul, Checklist, and Shopping Tips. This is my third post of the NDG School Survival Guide Series, so look out my upcoming school supplies haul video on my YouTube channel and stay tune for more posts by following my blog. Also, learn more about me in the recently updated About Page and read below for my post about high school orientation. FRIENDS 👬👭 – You get to see some of your friends before school. Orientation is a great friend get together for you and your pals before school to meet up and maybe hang out. Also you guys can catch up about your summer, and see some faces that probably haven’t seen in a while. I got meet and see some of my friends that I haven’t seen since elementary school, so I definitely enjoyed this part of orientation. The games 🎲 aren’t that bad and kind of fun – Okay, I do not participate in group activities that do not involve academics. Honestly, I’m more of a spectator for these kind of events, but watching the games were enjoyable and you really shouldn’t be too afraid participate. Meet new people and scout out new friends – Remember you’re not the only NDG out there, so don’t be afraid to talk to someone new in your groups or a game setting. Also, mix friends you met at your school with friends your friends made at their school. This is also an easier way to meet more people and makes more likely that they share similar interests.I really enjoyed mixing my friends with my old friends’ friends because I got to meet some more awesome people. This is the MOST FUN 1st OF SCHOOL YOU WILL EVER HAVE – Orientation is not you’re typical first day of school. You play games, do chants and participate or watch in some not-so-lame events. Also, you don’t want to show up to school wondering why a bunch of freshmen are chummy and what they’re laughing about. A FREE TOUR OF SCHOOL 🏫 – Get to know the campus ahead of time before school starts, with the free campus tour you probably will get during orientation. Also, this helps makes the first day less nerve wrecking and your advisors can give tips on bathrooms and the spots of the school so remember to ask questions. Meet some AWESOME Upperclassmen – At orientation, you probably will meet some upperclassmen who are willing to give you advice and answer any questions you may have at school. Remember they are there to help you and you shouldn’t be afraid to talk to them. My orientation advisor was really nice and friendly, because bought me some yummy snacks and was really nice about answering my questions. Get ahead of the game – One of the teachers at my orientation said there are 3 types of people: those who makes things happen, those who watch things happen, and those who wondered what happened. Be one of the first two types of people and don’t miss out on orientation. Trust me you don’t want to be one of those who wondered what happened. Walk in with your Friends – Going to orientation with your friends, make this special first day of high school less nerve wrecking. If you live close by, you could walk to school and take a walk test to see what time your should arrive and how long it took to be prepared for your actual first day. Leave Early – Make sure you have enough time ⏰ to get there and take in the high school orientation in a front eye view. If you arrive late, you’ll feel rushed and could make this day very overwhelming. KNOW THE ACTIVITY before YOU PARTICIPATE – A helpful tip, if you’re not a participator then don’t just raise your hand until you know what you’re in for. You never know, it may not be what you think. Follow instructions, participate, and be patient – Listen to your advisors or upperclassmen instructions on events and what to do. You don’t want to get lost, and then have to ask people for help. Also, participate in your group and be patient throughout the day. You may have to wait in long lines for your schedule and answer questions in your group. Be quiet, but not too invisible – I understand if you’re shy, but don’t be too invisible during orientation. At least, make a minor impressions on people you meet and don’t be too quiet all day. Have fun with the activities – Enjoy yourself and have fun with the activities during the day. In your groups or with your entire high school class, participate or watch. The day is only as fun as you make it 😉. Bring a bag 🎒 if you’re planning to buy anything – I went to also purchase my gym clothes in advance and forgot to bring a bag to help me carry my clothes. This lead to me dropping my gym shirt twice and kind of made it hassle walking around. Luckily it was the end of the day, so it wasn’t for long. Also bring water or snacks in your bag in case your orientation runs long or if they won’t be providing food. Remember P.A.C.E. – Positive Attitude Changes Everything. The day is as fun as you make it, so keep a positive attitude to have a positive time at your orientation. These were 7 reasons to go to Orientation and 8 awesome tips for the experience, and I hope you will at least take some of my advice. I really hope you liked this post and will continue follow-up on my blog. If you have any questions or suggestions, please respond in a comment, and don’t forget to answer my daily poll. P.S. If you feel like contributing to the blog, CHECK OUT the About page.